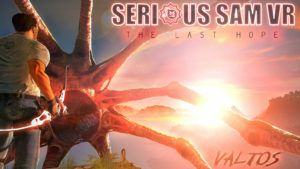 Serious Sam VR: The Last Hope just got bigger with an all new Valtos Update landing on Early Access. The update features a new planet – Valtos – featuring four different locations/maps including The Swamp, Ancient Breeze, The Old Forest and Green Dream. Also featured in the Valtos Update are six different enemies including Kalopsy, Siren, Swamp Monster, Air Trooper, Technopolyp and Air Sniper Trooper. After dealing with them Sam will have to fight toe to toe with the Swamp Hive boss, as scary as it is slimy. To help him in his mission, General Stone’s arsenal got even deadlier with new additions including a bow with piercing/explosive arrows and the deadly Devastator. Valtos Update also includes many different tweaks, fixes and optimizations such as vastly improved precision for the default sword projectile casting mode and improved shield energy display. 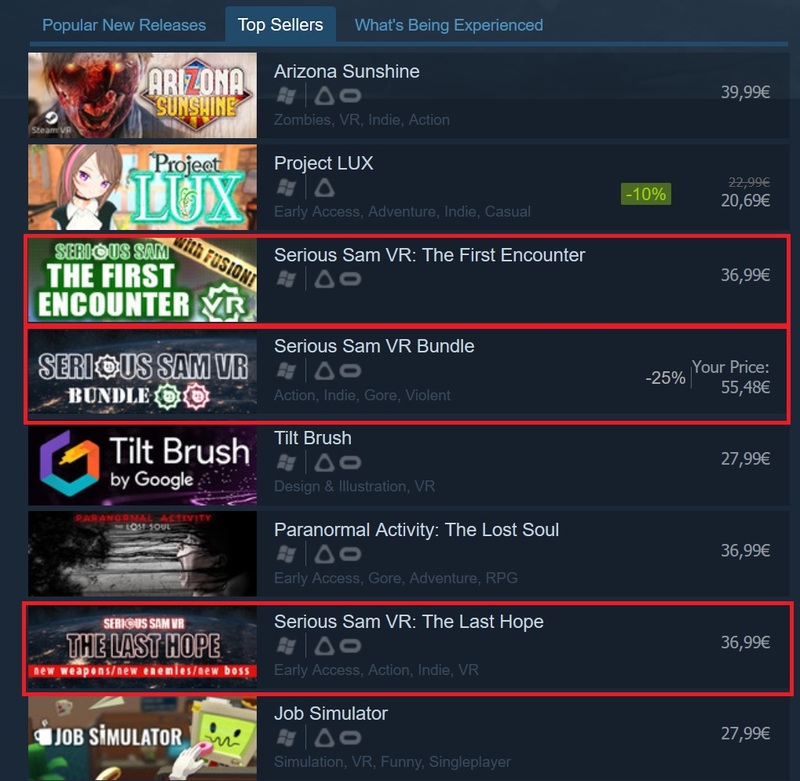 For more information visit Serious Sam VR: The Last Hope on Steam. Join us at biggest and craziest game developers conference in Europe, Reboot Develop 2017 in Dubrovnik from 20th – 22nd of April. Reboot Develop starts in two days and we are in final stages of preparation. More than 100 distinguished lectures will visit Dubrovnik to share their wisdom with interested audience. Our CTO, Alen Ladavac has the honor to open this years conference with his opening keynote Game Developer’s Meaning of Life. Also, Croteam’s main composer and CMO Damjan Mravunac will hit the stage with his guitar to sing best songs from Disney’s musicals. Or not. Who knows. Lead Gameplay Programmer, Goran Adrinek is returning once again to Reboot stage this time with a must-hear lecture about Mixed Reality in Serious Sam VR. Near the poolside area you can catch Reboot panelists Ante Vrdelja and Davor Tomicic discussing serious and less serious topics regarding game marketing and the art of stripping down. This should be fun. Hopefully some of this intrigued you enough to join us at beautiful seaside Dubrovnik. See you there! We’ve got some great news for you today. We have started the internal testing phase of the big Valtos update coming to Serious Sam VR: The Last Hope. As we mentioned before, this update will send mr. Stone to a new planet, Valtos, where he will battle across four gorgeous but extremely deadly locations. Along with aforementioned new locations the Valtos update brings three new powerful weapons, including a bow (explosive arrows included!). You will use these toys to annihilate new types of enemies and a new boss. We are very excited to see you play through this amazing new content, which you will be able to do in just under two weeks time – on Wednesday, April 26th – so stay tuned. 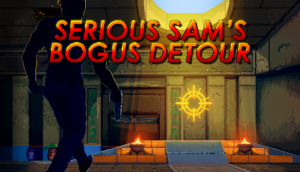 Looks like we’ve got ourselves the next great entry in the Serious Sam Indie Series – Serious Sam’s Bogus Detour! It’s a retro-styled action-adventure in the Serious Sam saga made by Hammerwatch developer Crackshell. 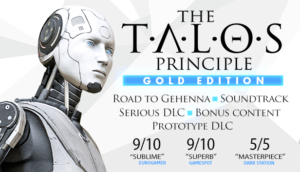 Battle through beautiful Mediterranean locales, dangerous biological weapons labs and even high-tech moon bases as a one-man wrecking crew or in four-player online cooperative for maximum chaos! Dominate the chaotic Survival and Versus modes or make your own mods, modes, and even total conversions with the included game editor. Serious Sam’s Bogus Detour is the biggest little Serious Sam game ever made! “Our boys in R&D have been looking into ways to combine this hot wave of so-called indie games with the tried and true Serious Sam profit formula and it looks like they’ve hit a homerun with Serious Sam’s Bogus Detour,” said Devolver Digital CFO Fork Parker. Serious Sam’s Bogus Detour marks a return to indie roots and a continuation of the Serious Sam Indie Series that includes Vlambeer’s Serious Sam: The Random Encounter and Mommy’s Best Games’ Serious Sam Double D.
For more information on Serious Sam’s Bogus Detour visit crackshell.dk or Steam, and follow @RealCrackshell on Twitter. SSVR: The Second Encounter is out? Already? Why, yes, it is! This Tuesday just got Serious. Sam is on fire! Visit South America, ancient Mesopotamia and Medieval Europe, and don’t forget to bring your chainsaw. Actually, bring two: dual-wield your new toys to defeat Mental or use your arsenal in a deathmatch against “flat peasants”! That’s right, SSVR: TSE will be getting a free Fusion 2017 update, bringing cross-platform co-op and other multiplayer modes (VR vs non-VR) and Steam Workshop support. SSVR: The Second Encounter is launching with a special 25% discount (until April 11th), but if you already own ANY other Serious Sam VR game there’s an additional 25% discount (stackable) – thank you for supporting Croteam’s VR division! We truly have the best fans in the world! 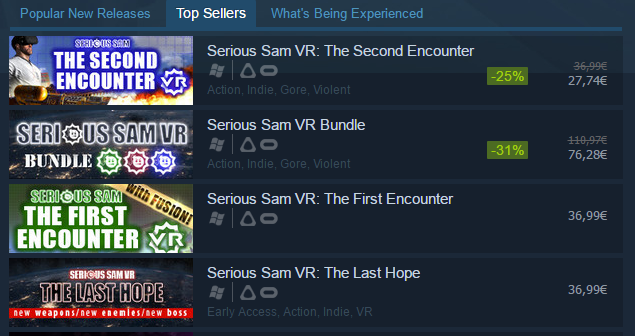 All four of our Serious Sam VR games landed on the very top of the Steam VR Top Sellers list in no time. Thank you! It’s been a great day so far. Serious Sam VR: The First Encounter, Serious Sam VR: The Last Hope and Serious Sam VR Bundle are currently on 3rd, 4th and 7th place on Steam VR Top Sellers List. This is truly a great success for us and our VR team. Big thanks to all our fans who are supporting us all these years and playing our games. We are preparing more surprises for you soon so be up to date with all the news on our social media channels. Stay serious and play Serious Sam! 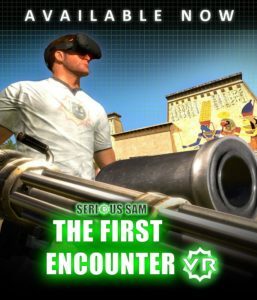 Serious Sam VR: The First Encounter is out from Early Access and it’s available as a fully-fledged game on Steam. For all the additional info and feedback visit our Steam Community page where our tireless IT and marketing team is ready to answer all the burning questions.